Hilltop Campground is a beautiful family owned and operated campground. Hilltop has been a family vacation resort since 1880. With large oversize camp sites surrounded by mature trees on a rolling terrain and over 500 feet of shoreline on beautiful all sports Lake Nepessing. 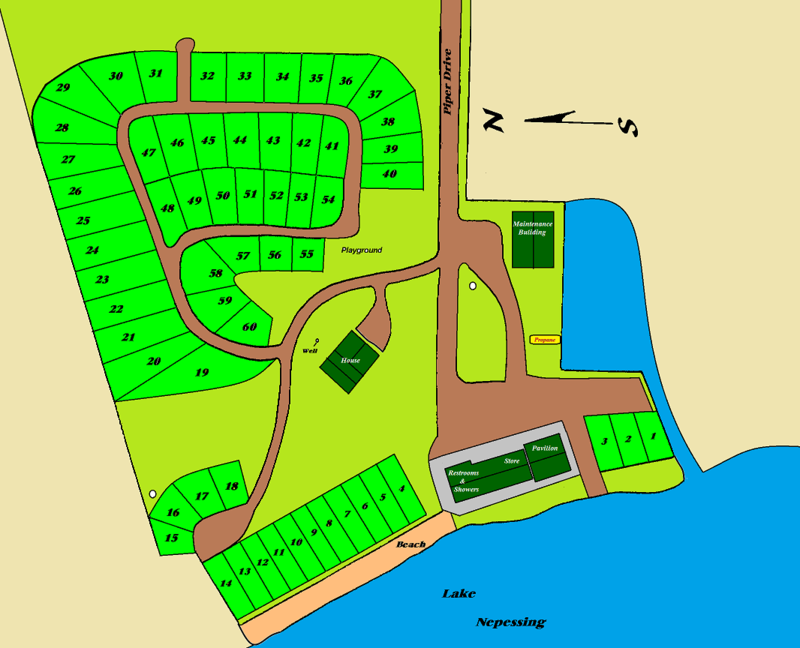 Our campground creates the perfect atmosphere for relaxation and recreation. Every site has 50 amp electric, water, sewer, picnic table, and a fire ring. We have a nice sandy swimming beach and a grassy shoreline picnic area. The 36' x 34' pavilion, with a 100 person capacity can be reserved for parties or family reunions. There is a boat launch and docking spaces for those who want to bring their water toys along. We have a fully stocked convenience store with everything from coffee, bacon, and eggs, to beer, bait, tackle, and firewood. For your convenience there are showers, restrooms, coin laundry, and a liquid propane filling station. Our service orientated staff is always ready and willing to help you enjoy your stay with us at Hilltop Campground. We look forward to your coming to visit us. Nearby, there are two beautiful golf courses and a lake front restaurant. There is a driving range, putt-putt golf, and a go-cart track within walking distance, just across the road. If we don't have it Kroger, Walmart, and Meijer are just 5 to 10 minutes away.